Solace’s Pilates sessions will tone that core and strengthen those muscles keeping you flexible and fit in a injury-free way – and the setting is gorgeous. Solace is one of the few, if not only, places in the city that has regular pilates sessions. Trained instructor Chandni Singh Siddique will take you through the Reformer Pilates class. A group class consists of just four students working on four machines called a reformer which means you get individualised attention. You can even book a private session at your convenience where the session will be curated to cater to your personal requirements. Super helpful if you’re recovering from an injury or require rehabilitation, Pilates is considered an injury-free way to exercise so you can stay fit always. Solace is perhaps the prettiest place in the city to work out. 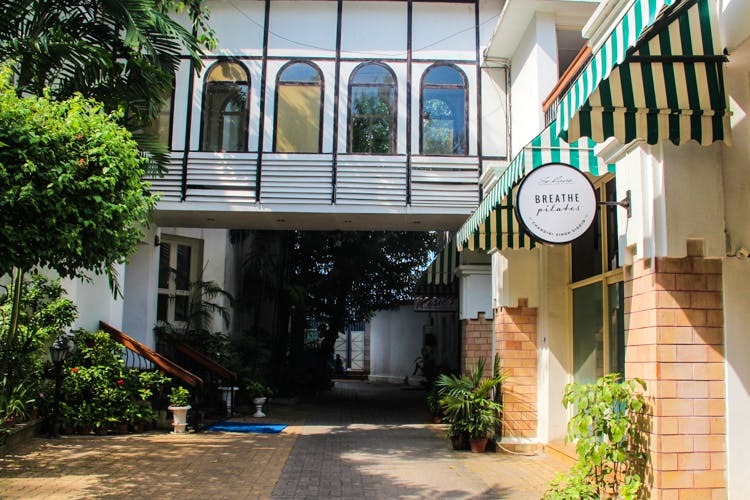 Located in a quiet lane, the studio is a bungalow that has been revamped to an international-level fitness centre and spa. It’s the ideal place to relax and rejuvenate. Tired after a grueling workout? You can head down to the spa to get some alone-time and unwind. Sign yourself up for a session. There are three group sessions during the week – on Monday, Wednesday and Friday – from 6-7 pm and from 7:15-8:15pm. It’ll set you back INR 10,000 for 12 classes. A single private session will set you back INR 1,700. For 12 private sessions a month, the pocket pinch is INR 18,000. Call Chandni at 9007193079 and she’ll be happy to provide you with more details.